As the leaves change color and the air turns crisp, it's nice to have a few activities that can help introduce preschoolers to the magic of fall. Whether you'd like to get out in nature or make a special fall craft at home, there are lots of fun ways to learn about and enjoy the changing season. Preschoolers can "help" clean up the yard by raking leaves. Then they can really have a great time jumping into the piles they've created. This is a great activity to try at home or at school, and you can involve the whole family if you choose. You'll need a child-sized rake for each little one as well as an adult-sized rake for making real progress on the leaves. 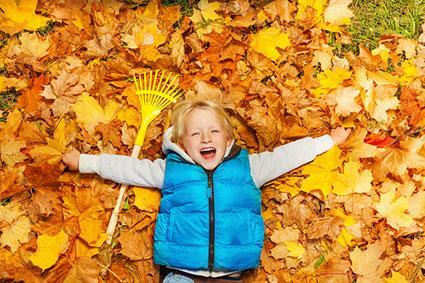 Consider raking up a few piles ahead of time so kids won't have to wait to start their jumping. Kids can make cool art while learning about the beauty and variety of leaves. 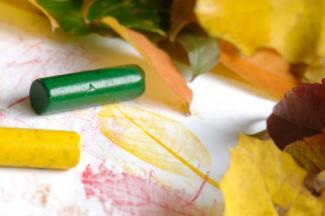 All you'll need for this fun craft are some crayons, some thin white paper, and a few leaves. Start by taking a nature walk to collect leaves for the project. Find as many kinds of leaves as you can. Choose leaves that aren't too dry. Back inside, place leaves upside down on a table so that the stem and veins are facing up. Take the paper wrappers off the crayons. Place a piece of paper over one leaf. Hold the paper steady while the child rubs the crayon over the surface of the paper. The veins and stem of the leaf will be transferred to the paper. Repeat with other leaves. Keep it simple. Don't worry too much about finding specific constellations or planets. Instead, focus on the moon, the Milky Way, and the night sky in general. Dress warmly. Autumn nights are chilly in most climates, so make sure you bundle up. Little ones will have more fun outside after dark if they are warm and toasty. Plan the evening together. Talk with preschoolers about the moon and stars and what they hope to see. Have them help pick out a blanket to sit on and make some hot chocolate to take along. Try to go in the morning if you can. Some preschoolers still nap in the afternoon, and even those that don't can get a bit tired late in the day. Make sure kids dress warmly so they can enjoy the activity even if the weather is crisp. If you have a wagon, consider bringing it along. Kids may be tired after walking around the orchard, and a wagon is great for hauling both kids and apples back to the car. Bring rain jackets and umbrellas in case of an unexpected shower. It's also wise to check the weather ahead of time. Whether you choose to pick the apples yourself or buy them, you can still make applesauce with preschoolers. Since part of the process involves sharp knives and heat, it's a good idea to use your favorite applesauce recipe to make up the sauce ahead of time. 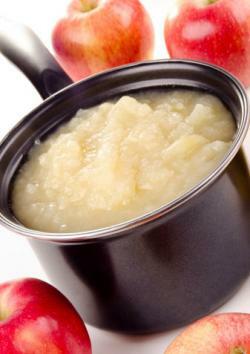 In addition to your cooled batch of applesauce, you'll need a sieve, a bowl, a wooden spoon, and some jars and labels. Place the sieve over a bowl. Spoon a few scoops of applesauce into the sieve. Give each child a spoon so he or she can help push the applesauce through the holes in the sieve. Continue adding sauce until you've strained as much as you want to. Help the kids spoon applesauce into jars and put on the lids. Allow kids to decorate the labels for the jars. You can use leaves as stamps to create beautiful designs on paper. 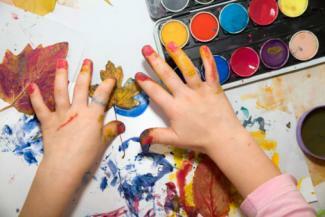 The process is simple, and this is a fun and messy art project for little ones. You'll need a variety of leaves, some tempura craft paints in fall colors, brushes, and white paper. A roll of paper towel is also a good idea. Protect your work surface with an old plastic tablecloth or large garbage bag. Have kids wear art smocks or old clothes. Pour some tempura paint into dishes and help kids apply the paint to the undersides of various leaves. Once each leaf is painted, press it down on the paper and then lift up. The leaf's shape will appear on the paper. Wipe the paint off the leaf with some paper towel and apply another color. Continue making leaf stamps to create your masterpiece. Although a nature walk is fun on its own, you can add a little extra excitement by turning it into a scavenger hunt. Before you set out on your walk, preschoolers can draw a picture of the items they'd like to collect. Then, as you walk along, keep an eye out for the things in the picture. Take a fall trip to the local farmer's market to collect some exciting gourds. Gourds come in all shapes and sizes, and most are fairly inexpensive. You can allow little ones to pick their favorites and then place all the gourds together in a bowl on your dining room table. This makes a great fall centerpiece and offers kids a reminder of their fun experience at the farmer's market. You can also color on the gourds with paints or markers to create unique decorations. 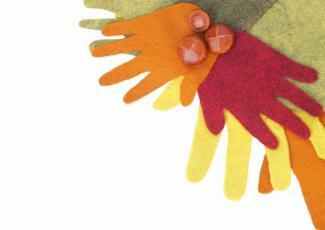 You can preserve those cute little hand prints and create a fun fall decoration at the same time with this easy project. It lets preschoolers practice their cuttings skills with safety scissors, and it's fun to help them trace their hands. You'll need stiff craft felt in three or four fall colors, some cardboard, a black marker, safety scissors, a few buttons, and some glue. Start by having the child spread her hand out on the felt. Trace around the hand. You'll need at least 12 hand prints. Help the child cut out the hand prints. To keep them from getting discouraged, you may want to cut out most of the prints yourself and leave just one or two for scissors practice. Cut the cardboard into a wreath shape. A good way to do this is to trace a large plate and then trace a smaller plate in the middle. Glue the felt hand prints to the wreath, overlapping them to look like leaves. Glue three leather or wood buttons on the wreath to look like acorns. Have kids help plan the menu and pack the picnic basket. They can assist in making peanut butter and jelly sandwiches and other simple foods. Since fall weather can change quickly, pack a large umbrella in the bottom of your picnic basket. You can set it up to provide shade or protection from rain. Dress kids in layers so they can be warm enough while they're eating but also not too hot when they are running around outside. Choose kid-friendly, portable foods like pouch applesauce, cheese sticks, cracker sandwiches, and juice boxes. Don't forget a trash bag to clean up your mess when you're done. No matter what fall activity you choose to enjoy with preschoolers, it's impossible not to get swept up in their excitement about the changing seasons. Enjoy this fun and magical time with the little ones.